A year ago, Corey Perry's average draft position in standard Yahoo! Fantasy Leagues was 43.5. Of course, he went on to put together the most well-rounded season of any player and finished as the No. 2 overall fantasy player, behind only Vancouver's Daniel Sedin. Hardly anyone saw that kind of season coming from Perry. Sure, the Ducks forward had a very solid 2009-10 campaign (27 goals and 76 points), but none of us expected what he did last season. But every year we seem to see guys like this -- players that we don't know too much about that end up having a major breakout season. Some erupt for seasons like Perry or Dustin Byfuglien had last season, and some are just on a smaller scale, like Brandon Dubinsky or Kris Letang, but either way, there are always plenty of players that perform beyond our expectations. The goal is to be lucky enough to have the right ones on your fantasy team. Whether it's on draft day, or picking up a player on waivers, or through a trade, the objective is to obtain players that are undervalued by everyone else. Take a look at our list of sleepers from last season to see how we did! As a rookie in 2009-10, Benn appeared in all 82 games for the Stars and totaled 22 goals and 41 points while receiving 14:42 of ice time per contest. In his second season, Benn's ice time increased to 18 minutes per game and he posted 22 goals and 56 points in just 69 games. We believe these numbers will continue to improve in his third season. The departure of Brad Richards will play a role in Benn's value this season, as the 22-year-old will surely be more involved on Dallas' top power play unit -- last season Benn only received 2:17 of PP ice time per game. You can expect it to now be closer to the likes of his teammates Brenden Morrow and Mike Ribeiro, who each received close to four minutes. The Stars have a solid core of top line players in Benn, Morrow, Ribeiro and Loui Eriksson, but after that the offense thins out relatively quickly. Regardless, Benn should still be a big fantasy asset this season, and you shouldn't hesitate to draft him. Boston's top line will likely include David Krejci, Milan Lucic and Nathan Horton, and last season, the Bruins' second line consisted of Patrice Bergeron, Brad Marchand and Mark Recchi. With Recchi now retired, enter Seguin. While Seguin's natural position is center, the Bruins have so much depth there that we expect to see Seguin lining up on the right wing on the second line. On a team with great depth, the Brampton, Ontario, native notched 11 goals and 11 assists while receiving just 12:12 of ice time per game in 74 overall contests, but Seguin showed off his skills during the 2011 playoffs -- in 13 postseason games, the youngster recorded 3 goals and 4 assists in just 10:35 of ice time per game, including some spectacular highlight-reel goals. Playing for the Plymouth Whalers in the OHL in 2009-10, Seguin recorded 48 goals and 106 points in 63 games, and we believe that kind of production will eventually translate to the NHL. The second pick in 2010, Seguin has boatloads of expectations, and while he might not reach them this coming season, we think he takes a major step en route to eventual stardom. Many of you probably don't know who Ryan Ellis is. Well, get used to his name. Come this time next year, Ellis will probably be ranked among the top 20 fantasy defensemen, possibly even higher. He's the ultimate fantasy defense prospect. At just 20 years old, Ellis is primed to crack Nashville's opening night roster and should end up finding himself on the team's second defensive unit, somewhere behind Shea Weber and Ryan Suter -- he should also see plenty of power-play ice time based on his offensive upside. Playing for the Windsor Spitfires in the OHL, Ellis posted 24 goals and 101 points in just 58 games. He also led the Spitfires to the OHL Championship by registering 31 points in 20 playoff contests -- first among all defensemen. Ellis has been questioned because of his small frame (5-foot-10, 179 pounds), but he plays with a bit of an edge (61 PIMs last season) and knows he has the skill to succeed in the NHL. "To this point, not a lot of guys who are 6-foot-4 are doing what I did in juniors," Ellis said. "He (Rafalski) was about my size and look what he accomplished. There's always room for smaller guys in the NHL. People doubted him and Marty St. Louis, too, and they proved a lot of people wrong. Whether you're 6-foot-4 or 5-foot-9, you have to be confident and play your own game." We have full confidence in you, Ryan Ellis -- don't let us down. Berglund stormed into the League in 2008-09 to post 21 goals and 47 points for St. Louis, but then suffered a major sophomore slump the following season (just 13 goals and 26 points in 71 contests). However, last season Berglund returned to his rookie form and posted a very impressive season -- his 22 goals, 30 assists, 26 penalty minutes and 175 shots on goal all were career bests. Expect his sophomore season to be the outlier. The first-round draft choice clearly has a bright future and should be one of the key elements to a young and upcoming Blues squad that includes a deep offensive unit -- David Backes, Chris Stewart, Andy McDonald, T.J. Oshie and Alexander Steen likely make up the top-six forwards along with Berglund. As a rookie, Berglund received 14:43 of ice time per game and 3:14 of PP ice time; in his second season, he saw just 13:30 total and 2:16 of PP ice time; last year, Berglund's total ice time rose to 17:11 per game with 2:53 of power-play ice time. St. Louis' additions of Jason Arnott and Jamie Langenbrunner could hinder Berglund a little bit, but we still anticipate his ice time and his production to continue to increase as he continues to develop as a player. This could be a complete hit or miss sleeper prediction. At 35, Souray returns to the NHL as a member of the Dallas Stars after a one-year demotion to the Oilers' AHL team. While his production wasn't all that impressive with the Hershey Bears (4 G, 15 A, 85 PIMs in 40 games before going down with an injury), Souray is still remembered for his extremely productive fantasy seasons of years past. There were hardly any defensemen that were posting numbers like Souray was when he was with the Canadiens -- in his two most recent healthy seasons (2006-07 and 2008-09) he averaged 25 goals, 34 assists, 117 PIMs, 36 PPP and 246 SOG. 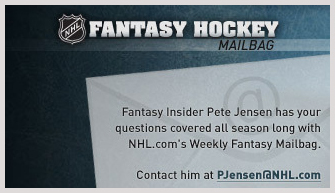 Those kinds of numbers would have had him as the top fantasy defenseman last season. Obviously Souray constantly faces the injury questions, and rightfully so -- he's appeared in less than 63 games in six out of the last nine seasons (includes last year). He's a risk to draft for sure, but Souray has made it public that he's dedicated himself to getting in great shape this offseason and is healthy and ready to go with his new squad. Souray will likely start the season on the team's second defensive unit, but he should certainly receive several power play minutes alongside Alex Goligoski. If he manages to stay healthy for 60-plus games, Souray could factor into the top-20 fantasy defensemen this season. Coming off a productive but injury-plagued campaign with the Rangers last season (9 goals and 23 points in 29 games), Prospal signed a one-year deal with the Columbus Blue Jackets, which should help boost his fantasy production. He has the potential to be on the team's top line at left wing with superstar Rick Nash and the newly acquired Jeff Carter. That will surely help Prospal's value and should result in plenty of assists, similar to how it did when he found great chemistry on a line with Marian Gaborik with the Rangers, and Martin St. Louis and Vincent Lecavalier with Tampa Bay. Prospal has averaged at least three minutes of power play ice time since the 2007-08 season, so you can expect him to continue at that rate while being a part of Columbus' top PP unit. Excluding his 2008-09 season and his injury-riddled season last year, Prospal has been able to accumulate at least 54 points every season since 2001-02. At 36 years old, Prospal brings a great amount of veteran leadership to a young Columbus group, and if he can stay healthy, he's a welcome sight to any fantasy team. Remember him? Mueller hasn't appeared in an NHL game in a year-and-a-half due to two concussions in a six-month span, but he has definitely worked hard to make sure he's ready to go this season. While the Avalanche aren't expected to be the most offensive team in the League, expect to see Mueller on the team's second line on the wing to Paul Stastny -- that alone should be enough reason to draft Mueller. Stastny recorded 59 assists in the 2009-10 season and then had 35 last year, but you can expect that number to climb more toward the 50 mark with a goal scorer like Mueller as his sidekick. The No. 8 pick in the 2006 draft by the Coyotes had a big rookie season in 2007-08 with 22 goals and 54 points, but then Mueller struggled in his next season and a half with Phoenix. That's when he was dealt to the Avs, and things quickly improved for Mueller -- he notched 9 goals and 20 points in just 15 contests before his first concussion. It might take the 6-foot-2 power forward a little time to get back into the swing of things, but with Stastny as his center and the likelihood of decent power-play time, expect Mueller to post a solid stat line across the board. A lot of Sullivan's fantasy value could depend on Sidney Crosby's health. If all things are right in the Penguins locker room, Crosby would center the team's top line with James Neal and Chris Kunitz on the wings. The second line would consist of Evgeni Malkin in the middle with Tyler Kennedy on the right and Sullivan on the left. If this is the case, clearly the veteran winger possesses plenty of fantasy value. Take into account that Sullivan may even play the point on one of the two power-play units (coach Dan Bylsma has stated that they will go with four forwards on their PP more than often), and you're looking at a sure fantasy sleeper. The former Predator will slip in drafts because of his injury-plagued 22-point campaign last season, but make no mistake, Sullivan is poised for a solid 50-plus point season this year if he can stay healthy. However, that will be the greatest challenge for Sullivan -- in the past five seasons, the 37-year-old has only appeared in more than 70 games once. Sullivan won't shoot the puck a ton, but grab the veteran forward late in your draft and he should be able to rack up plenty of assists and power-play points for your team. The Flyers will look like a completely different team when they hit the ice this October, but that doesn't mean their players should be devalued come draft day. While Philadelphia's top-five forwards are all but set in stone with Claude Giroux, James van Riemsdyk, Danny Briere, Scott Hartnell and newcomer Jaromir Jagr, their sixth forward will be full of plenty of intrigue. As of now we project Voracek to fill that void, but it isn't a lock as other newcomers Wayne Simmonds and Brayden Schenn will be fighting for ice time as well. At 6-foot-2 and with smooth hands, we think Voracek would be a great complement to the Briere-Hartnell duo, and if that's the case, Voracek could be a major steal on draft day. Drafted with the seventh pick in 2007, Voracek has posted similar stat lines over the last two seasons to average out to: 15 goals, 33 assists, minus-5, 26 PIMs, 11 PPP and 169 SOG. Now a member of the Flyers, you can safely expect his plus/minus to improve, and if he can stick on that second line, Voracek should put together a solid season. Draft him with a late flyer, but keep an eye on things during preseason, as Schenn and Simmonds will surely be in the offensive mix. Another name several of you may not know, Dalpe could be worth one of your last picks in a fantasy draft. The Hurricanes' 21-year-old prospect was a second-round pick in 2008, but really blossomed in the AHL last season with 23 goals and 57 points in 61 games. Dalpe has received high praise from his coaching staff and should start the season as the team's No. 3 center with Chad LaRose and Alexei Ponikarovsky on his wings -- not too enticing, right? Dalpe projects as a versatile forward that plays a solid two-way game, but he certainly has the skill to move up to the second line at some point. While Carolina's first line will likely consist of Eric Staal, Jussi Jokinen and Jeff Skinner, the second line isn't exactly set in stone. Dalpe could find himself playing some wing instead of Anthony Stewart, or he could overtake Brandon Sutter at center if things don't progress for Sutter. Dalpe potted 3 goals in 15 games with the Canes last season while averaging 7:56 of ice time, but you can surely expect him to receive more playing time this season. Dalpe will go undrafted in several leagues, but if you're picking in a deep league, he's certainly worth a flyer and could be a big-time factor and popular mid-season pickup at some point this year.